After the “literary parade” Friday and then trunk or treating Saturday I’ve found myself thinking of Halloween 2012 in the past tense. For the past 2 days I’ve been fighting the urge to tear down the false cobwebs (I dutifully ignore the real ones) and pack up the jack-o-lanterns. Alas, it will have to be put off a bit longer. As for today. 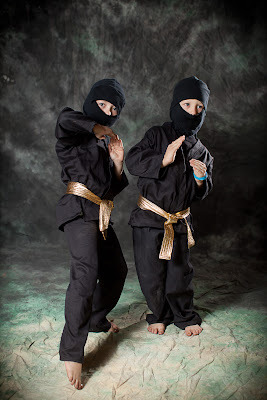 Well, today I’ll show you my Ninjas. I did it again didn’t I? I was half way up the step stool going after those polyester cobwebs. “Halloween is tomorrow, Halloween is tomorrow,” I’m just going to keep repeating that to myself until I go to bed. The cobwebs are coming down the minute my trick-or-treaters come home. Jens little feet give him away!